In our body's, brain, the Cerebrum, is paired structure derived from the embryonic telencephalon, composed of a right and a left cerebral hemisphere with four lobes on each side, which lies above the tentorium cerebelli taking up most of the intracranial cavity and with about 85% of the total weight of the brain. In our body's, brain, the Cerebrum, as part of the forebrain (prosencephalon), is responsible for the highest mental functions, that includes the cerebral cortex. In our body's, brain the Cerebral Cortex is a thin outer layer of gray matter in the cerebrum. In our body's, brain the cerebral cortex is a sheet of neural tissue, outermost to the cerebrum consists mainly of neuronal cell bodies and dendrites on the surface of the cerebral hemisphere that developed from the telencephalon and folds into gyri (gyrus). In our body's brain, the Corpus Callosum (Colossal Commissure), a broad plate of dense myelinated fibers that reciprocally interconnect regions of the cerebral cortex in all lobes with corresponding regions of the opposite hemisphere, is a wide flat tightly bundled nerve fibers with approximately 200 million axons, that connect the right and left hemispheres of the cerebrum (telencephalon). In our body's brain, the Corpus Callosum lies beneath the cerebral cortex at the longitudinal fissure. In our body's brain, the the Cerebrum (Telencephalon) controls all voluntary actions in the body, assisted by the cerebellum. In our body's, brain, Superior Longitudinal Fasciculus (Superior Longitudinal Fascicle) is a pair of long major fiber pathways of bi-directional bundles of neurons connecting the front and the back of the cerebrum, specifically the supramarginal gyrus of the parietal lobe with the middle frontal gyrus/dorsolateral prefrontal cortex. In our body's, brain, the Telencephalon refers to the embryonic structure, from which the mature cerebrum develops. In our body's, brain the Telencephalon is the anterior subdivision of the embryonic forebrain (prosencephalon) or the corresponding part of the adult forebrain that includes the cerebrum and associated structures. In our body, the largest and most obvious portion of the brain is the cerebrum, which is divided by a deep longitudinal fissure into two cerebral hemispheres. The two hemispheres are two separate entities but are connected by an arching band of white fibers, called the cerebrum that provides a communication pathway between the two halves. 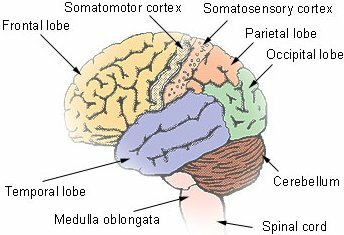 In our body, the each Cerebral Hemisphere is divided into five lobes, four of which have the same name as the bone over them: the Fontal Lobe, the Parietal Lobe, the Occipital Lobe, and the Temporal Lobe. A fifth lobe, the Insula or Island of Reil, lies deep within the Lateral Sulcus.